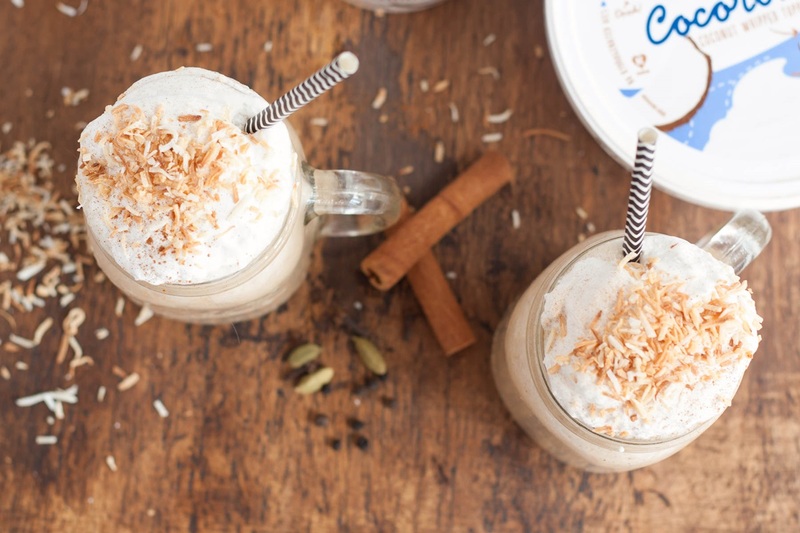 This coconut chai smoothie recipe is a cool & creamy breakfast treat (or a dessert milkshake!) created by the lovely and talented Brianna. It’s for our upcoming dairy-free menu plan for this year’s 21 Day Dairy-Free Challenge sponsored by So Delicious. The Challenge runs from January 23rd to February 12th, but you can still sign up for some great goodies. They’ll send you new coupons, dairy-free tips, a shopping list, snack guide, and more! 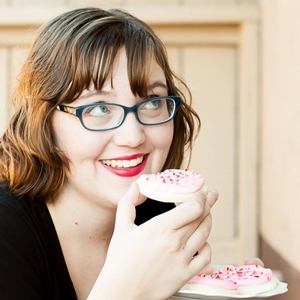 Brianna H. loves creating gluten-free (allergy-friendly) snack-worthy meals and desserts that taste just like what you had when you were a kid. 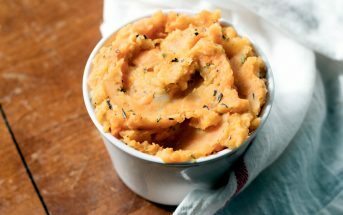 She has written 3 cookbooks and writes an allergy-friendly, gluten-free food blog at Flippin’ Delicious. And I can vouch that Brianna’s recipe creation skills are top notch. She was a winner last year in one of our recipe contests for her amazing Mexican Hot Chocolate Donuts. More recently, I had the chance to meet Brianna in person, and can honestly say that she’s just as sweet as her recipes! Hi! I am Brianna from Flippin’ Delicious and I am very excited to be sharing a recipe with you here on Go Dairy-Free, in honor of the annual So Delicious 21 Day Dairy-Free Challenge. 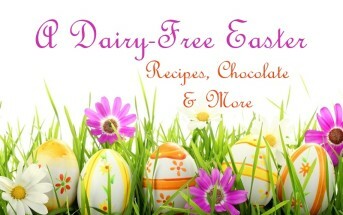 My family started eating dairy-free during this 21 Day Dairy-Free Challenge last year. As a result of the challenge we discovered that our toddler had leaky gut and has problems digesting dairy proteins. We also discovered that my husband is lactose intolerant. Since then many So Delicious products have become staples in our pantry and fridge. I always have at least a pint or two of their frozen dessert in our freezer to satisfy my sweet tooth! I LOVE breakfast. I am all about dairy free red velvet donuts, or my favorite blueberry puff pancakes. I am even known to eat one of my famous vegan, gluten free soft frosted sugar cookies for breakfast on occasion. However, I reserve those recipes for the weekends when I have a little extra time on my hands. During the week, breakfast has got to happen fast or it won’t happen at all. For this reason, I wanted to create the perfect dairy-free breakfast smoothie. One of my favorite beverages is chai tea. There is a local tea shop in my area that has a fabulous spicy chai tea that is my absolute favorite. I love splashing in a little bit of French Vanilla Coconut Creamer in my mug. 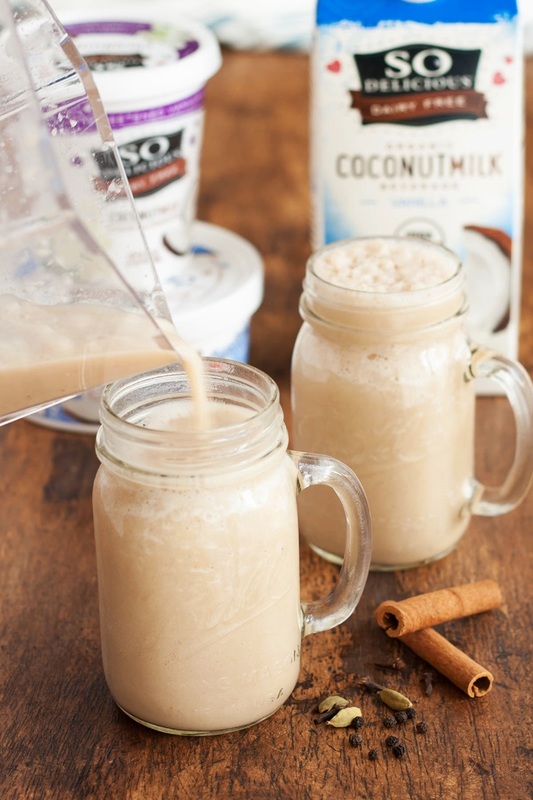 That comforting beverage inspired the breakfast Dairy-Free Coconut Chai Smoothie that I am sharing with you today. It is creamy, just barely sweet, and has just a touch of caffeine to get you started in them morning. I took my favorite brewed spicy chai tea and blended it up with some Unsweetened Vanilla Yogurt Alternative, Vanilla Coconut Milk Beverage, and a ripe banana for some sweetness and added creaminess. I kicked up the chai flavor with a little extra cinnamon, cloves, ginger, cardamom, and freshly ground pepper. If you want your smoothie to be on the sweeter side, more reminiscent of a coffee shop blended drink, add your favorite sweetener to taste. Next time I blend up a dairy free coconut chai smoothie for breakfast I am going to add just a spoonful of coconut sugar. Some vegan protein powder would alternatively be the perfect addition to your smoothie, if you have some on hand. I just had to top my coconut chai smoothie off with some CocoWhip and a sprinkle of toasted coconut. That garnish makes a world of difference. I am no longer sipping a smoothie on my way to work, but I’m indulging in a creamy milkshake. Place the banana, cooled tea, milk beverage, and yogurt alternative in your blender. Add the spices and blend on medium speed until smooth. Add ice and blend until you reach the desired consistency. I used 2 to 3 cups of ice. 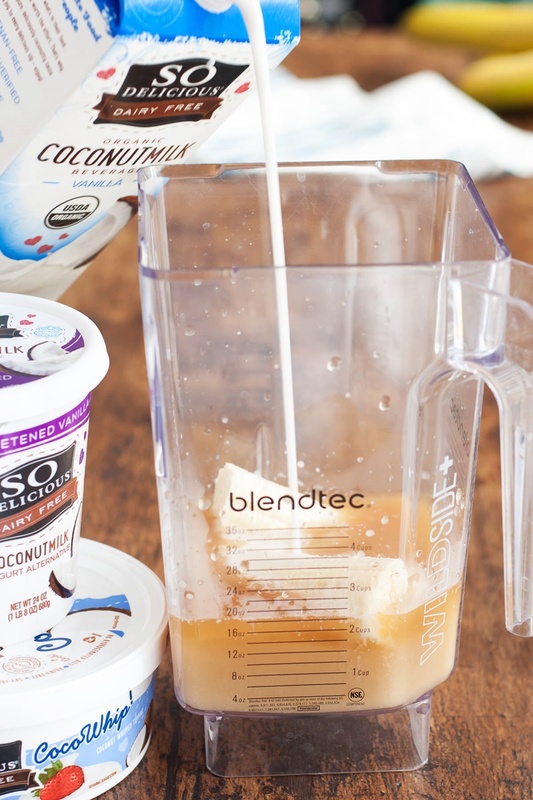 Pour your smoothie into glasses and top with CocoWhip and toasted coconut, if desired. I just adore chia tea lattes and have one almost everyday so I know for a fact that I would love this recipe as well. It’s going to be perfect as the weather is starting to warm up. Love chai and love milkshakes! This blends the two perfectly into a fab treat. The garnish sounds delightful. Fab photography as ALWAYS Brianna. I’m not a chai fan–but I’m thinking with all the spices this would be good! 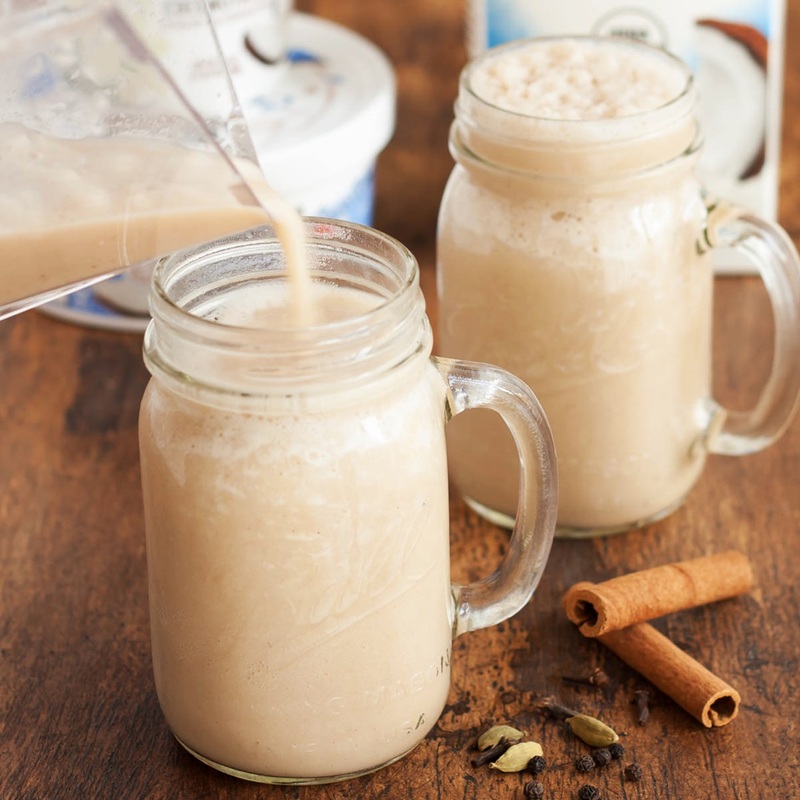 Chai is my favorite beverage and I love that you made it into a smoothie. Looks incredible! Those chai spices have to be my favorite collection of flavors. 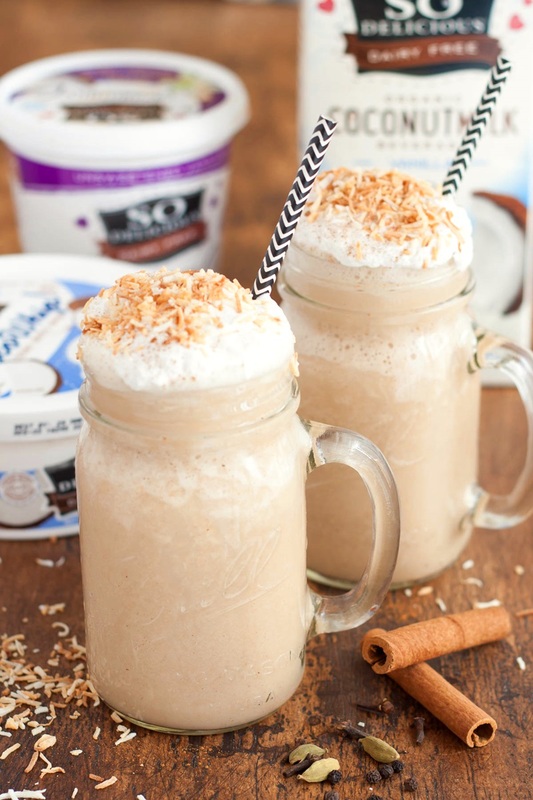 I usually use them in savory cooking, but would love to try it in this smoothie! Great way to infuse some extra flavor with the tea! Just made this and it was spot on chai flavored—if only I had had some of the Cocowhip. That stuff rocks our world … a game changer for the dairy-free-ers. Dang, you are fast lady! Glad you enjoyed it! Brianna does do an AMAZING job with flavors.